I LOVE crispy fried chicken, but I am not crazy about all the extra calories that come from frying. 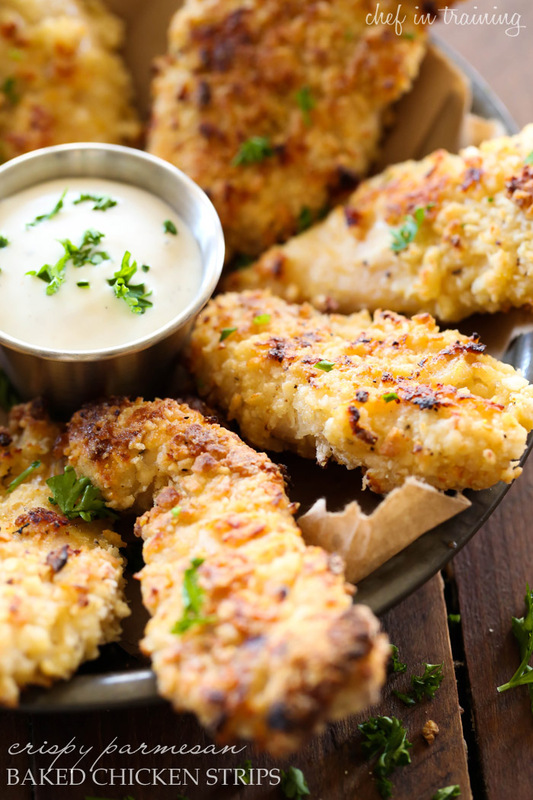 This chicken gets crispy on the outside creating the perfect bite and best of all its BAKED! The flavor of this chicken is incredible. Each and every piece of chicken was gobbled up by our family and everyone was sad when they were gone. We dip ours in ranch dressing and it really compliments the flavor wonderfully. These Crispy Parmesan Baked Chicken Strips are perfect for any occasion and my picky eaters can’t get enough of them! Thats a win all around! This chicken is cooked to perfection! The flavor is SO amazing! In a small zip-lock bag, mix together salt, pepper, garlic powder, onion powder, and cayenne pepper. In a large zip-lock bag mix together buttermilk, Franks Hot sauce, and 1 Tablespoon of spices from the small zip-lock bag. Add chicken tenders to the bag and zip tight. Make sure the chicken is well coated. (I then put this bag in a second zip-lock bag to make sure there is no leakage in my refrigerator.) Refrigerate for three to four hours or up to 24 hours. Line a cookie sheet with parchment paper and place butter on it. Put it in the oven until the butter is melted. Place chicken on top of the melted butter in the cookie sheet. Bake for at 400 degrees F for 13 minutes and carefully flip and bake another 5 to 8 minutes. Turn on broiler and broil until chicken becomes the crispness you like. Looks delicious! I love making chicken tenders for dinner. They are so quick and easy. Can't wait to try this version. Pinned! Is the recipe scaled for 10 chicken tenders or 12 chicken tenders, as the ingredient list says 10, but the directions say to put 6 chicken tenders in each of the two bags. There's probably not a big difference, but I intend to make only half a recipe and wanted to be sure. Thanks. I love the recipe you publish. I just have to start trying them. They all look delicious. There's an error in the ingredients. It says 10 tenders, but the directions say 12. In either case, though, a TABLESPOON of salt is a lot for @ 4 servings. Especially considering the hot sauce and parm cheese will add sodium. I'd leave out the salt altogether. Thank you Nikki for the nice recipe. Have a great day! Can't wait to try the chicken tenders!! Hi Nikki, we loved this idea! Since I eat a little differently, I made a few changes that could help gluten free, low-carb folks. If you have heard of Trim Healthy Mama, these changes make it an E meal. I used pork steaks since I didn't have any chicken thawed out. I cut them cross grain into little strips. I replaced buttermilk with 0% Greek yogurt, almond flour instead of flour, regular oats ground in food processor instead of panko crumbs, and coconut flour instead of cornmeal. I used the same amounts as posted. The result? Oh my gosh, so savory and even my picky husband enjoyed it. Since it was pork, it took a little bit longer on both sides; perhaps an additional 5 min. I kept an eye on the tray in any case. I love the idea of using zippy bags for easier clean up. I did have some coating mix left so I saved it in a clean zippy bag and placed it in the fridge. We'll try it with the chicken in a day or so. We enjoyed this over a bed of mixed greens with Kale, Romaine, and baby spinach with a side of steamed broccoli and topped with a sprinkle of grated Asiago cheese. Nom nom. When my granddaughters were little and would stay, this was our "go to meal" because they could make it. Our was a little simpler and we would roll the chicken strips in yogurt and then in a mix of parmesan and bread crumb, salt and pepper. Spray a cookie sheet and drizzle a bit of olive oil over the top. We started when they were two and now they are both good chefs. They can tear up some lettuce while the chicken is cooking and add some tomatoes etc for salad. I would give it a 5 but it won't let me rate it. Parmesan grated cheese--not the pulverized stuff in the green shaker tube that you might sprinkle over the top of a delivery pizza, right? How well do these freeze? i am thinking about making a large batch of these so my hubby and roomy can feed themselves when I am at work. Does anyone know the calories, fiber, fat, protein content of this recipe? I'm counting fiber and protein for my mother. You're better off sticking to a diet restricted cook book rather than a home cook page. I wouldn't rely on anyone for these type of critical answers except books catered to her dietary needs. Made these today and I agree with other reviews how much chicken is used? Also mine didn't get golden brown like the picture shows... They were spicy not Parmesan tasting at all! I ended up making another batch and frying them and they were so much better. First batch the coating came out hard from broiling them. i do a lot of cooking not sure what happened. The chicken parmesan baked chicken recipe uses a ridiculous amount of plastic zip lock bags. Use reusable kitchen ware instead. Way to much ziplock bags, and creating much work.. they look good I'm going to pass, there has to be an easier way. LOL. I was going to say that this is ziplock bag abuse. Not easy to find ingrediants in local mrkt. Is 1 Tablespoon of salt correct ? Seems to be way to much. Made for dinner and have decided to cut salt back to 1 teaspoon. Do you use the regular Frank's Hot Sauce, or the Frank's Buffalo Wing Sauce? Why do you put the spices in a ziplock bag at the beginning? Do all these spices go in the bag with the breadcrumb mixture later? Directions are confusing because it says add "remaining" spices, but there is no earlier indication that something should be done with some of the spices. All the bags are so wasteful too. Contribute to less trash by using plates or bowls. Unfortunately, the recipe is written poorly. There's the discrepancy with the # of chicken tenders. And, step 1 says to put a few spices in a small ziploc bag. But, there is no mention of that small ziploc bag again in the recipe. Also, step # 5 mentions the "remaining spices." Well, there are no remaining spices! So.... after much confusion I ended up dumping all my chicken tenders, about 3 at a time, into the large ziploc bag (what's the point of separating them into 2 bags? ), and after arranging them onto the cookie sheet, I then sprinkled the spices from the small ziploc bag with a spoon onto the chicken. They weren't what you'd call crunchy. Rather, there were a few with a bit of crunchy on the edge. All in all, we all loved the flavor of these and I think I'll re-do this recipe with 2 plates or bowls of ingredients (step 2, then combining steps 1 & 5), 86 the melted butter (that seems to have made mush out of what could have been crunch). I believe the reason she used the term remaining spices was because she put 1 tablespoon of the spices in bag to marinate. "I LOVE crispy fried chicken, but I am not crazy about all the extra calories that come from frying." "We dip ours in ranch dressing and it really compliments the flavor wonderfully." Hopefully it's fat-free Ranch or else you just canceled out all the calories you saved by baking it, and then some. It's like the people who order McDonalds with a Diet Coke. Has anyone tried foil? I don't have any parchment paper on hand. What's with all the ziplock bags?! What senseless waste. How about using bowls, tupperware etc. that won't contribute to the destruction of our planet so quickly. Wow. Super disappointed. The spices and the butter milk all smelled amazing. Cooked them on the parchment paper and they never crisped up. They actually were mushy and the breadding just stuck to the paper. Next time I will deep fry them. How spicy are these with the hot sauce and cayenne pepper? It sounds pretty good except I'm a turkarrian and can thus only eat turkey. Can I make this with Turkey thanks. Very disapointed. The chicken strips partially golden, but otherwise stayed very "floury". Not sure how the pictured chicken strips got so beautifully golden without being fried. Not able to rate it but, if I could, it would only get 1 star. I am making this forndinnerntonighr. Strips are marinating in the 'fridge now. Going for a 5 hour marinade. Can't wait to try the finished recipe. Thank you for sharing.